"Banana" redirects here. For a banana bunch, see Food. 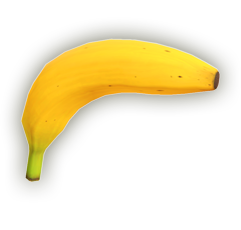 Official artwork of the Banana Gun from Super Smash Bros. Ultimate. The Banana Gun (バナナガン, Banana Gun) is an item introduced in Super Smash Bros. Ultimate. The Banana Gun is a one-use ranged item that appears as a simple banana. Contrary to its appearance, it fires a single banana fruit "bullet" that travels forward slowly and explodes with contact with anything, dealing high knockback alongside a comical banana-filled explosion. Once its single round of ammo is used, throwing it causes it to turn into a Banana Peel. Equipping the Piantas, Swanky Kong or Ukiki Support Spirits will give the player a Banana Gun at a start of a match. Ness holding a Banana Gun in Ultimate. A similar weapon is used by the Eggplant Wizard in the animated series Captain N: The Game Master. The gun is held and fired in an identical fashion; however, when struck by the banana 'bullet' the target is trapped in a giant banana peel as opposed to exploding. A similar weapon is used by Big Boss in Metal Gear Solid: Peacewalker. It cannot fire a banana 'bullet' however. This page was last edited on April 6, 2019, at 22:47.